These data represent the Biotic Component (BC) of the Coastal and Marine Ecological Classification Standard (CMECS) for estuaries of the West Coast of the contiguous United States. The BC is organized into a branched hierarchy of five nested levels: biotic setting, biotic class, biotic subclass, biotic group, and biotic community. Classes and subclasses of the BC are determined by the dominant biota (defined as the most abundant in terms of percent cover) of the substrate. Following the methods developed by the Oregon Coastal Management Program (OCMP) – Oregon Department of Land Conservation and Development (http://www.coastalatlas.net/documents/cmecs/EPSM_CoreGISMethods.pdf), we cross-walked attributes from the National Wetlands Inventory (NWI) and NOAA’s Coastal Change Analysis Program (C-CAP) into select classifications at various levels of the Biotic Component. These classifications were applied to estuaries currently part of the Pacific Estuarine and Marine Fish Habitat Partnership’s (PMEP) inventory (n=444), within the “West Coast USA Current and Historical Estuary Extent” (PMEP) layer. 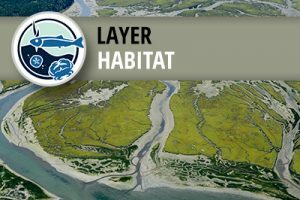 Data for the majority of estuaries in Oregon come directly from the Oregon Coastal Management Program’s (Oregon Department of Land Conservation) mapping effort. For full documentation of CMECS, see https://coast.noaa.gov/data/digitalcoast/pdf/cmecs.pdf.